Sugar Substitutes Vs Sugar – Which is Healthier For You? Sugar Substitutes Vs Sugar – Which Is Healthier? People watching their weight and blood sugar levels often use sugar substitutes in place of table sugar (sucrose). But is this a healthy choice? Can sugar substitutes actually lead to unwanted weight gain and/or increased blood sugar levels? Read on to learn more about sugar substitutes and their possible effects on your body. 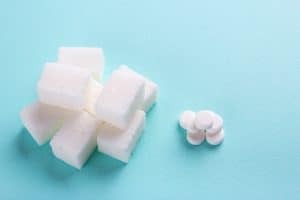 Sugar substitutes consist of artificial sweeteners developed in the laboratory (e.g., saccharine, aspartame), and intense sweeteners obtained from natural sources (e.g., stevia). They can be used as table-top sweeteners, in food preparation at home, or used as additives in processed foods. Foods such as; soft drinks, desserts, candy, and breakfast cereals. Do Artificial Sweeteners Contain Calories? Most artificial sweeteners don’t contain any calories. Examples of non-caloric table-top sweeteners include aspartame (Equal®, NutraSweet®), sucralose (Splenda®), and cyclamate (Sucaryl®, Sugar Twin®, Sweet’NLow®). People add these sweeteners to their tea and coffee. Other sweeteners do contain some calories. But, because they are so much sweeter than sugar, very little is needed. Therefore, the overall caloric content is much lower than sugar. These sweeteners may be found in foods labelled as ‘sugar free’ or ‘no added sugar’ and in liquid medications such as cold syrups. In past years, artificial sweeteners have come under attack regarding their potential to cause health problems – including cancer. This dates back to the 1970s when research studies showed that saccharin caused bladder cancer in laboratory rats. In recent years, the National Cancer Institute and other U.S. health agencies have concluded that artificial sweeteners approved for use in the U.S. (and Canada) do not cause any serious health problems. Do Artificial Sweeteners Help Or Hinder Weight And Blood Sugar Control? Much has been said about the increase in the incidence of obesity over the past few decades, coinciding with the increased use of artificial sweeteners. Could there be a connection? Diabetics have been encouraged to use artificial sweeteners in place of sugar to control blood sugar levels and to lose weight. 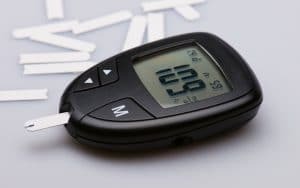 However, some researchers have observed increased blood sugar levels in both mice and humans fed artificial sweeteners. This is thought to be due to changes that sweeteners cause in the gut. Sweeteners may either lower the levels of gut bacteria that help us to resist weight gain. Or, they may encourage growth of bacteria that promote fat storage. Studies have also shown a connection between artificial sweetener use and weight gain in both adults and children. Why would that be, considering the lower calorie content? Sweet taste triggers our appetites. When the sweet taste is followed by the anticipated calories, we feel full and satisfied. This is called the ‘food reward’. But since artificial sweeteners contain few or no calories, they do not satisfy our cravings. This leads us to search for our food reward elsewhere – in foods that contain calories. Furthermore, it is thought that the degree of food reward we get from eating calories is reduced when we use artificial sweeteners on a regular basis. As a result, we need more and more calories to achieve our food reward. Researchers in Canadian universities showed that daily use of artificial sweeteners during pregnancy was associated with an increase in the infant’s body mass index (BMI) at one year of age. There was no such association with increased infant body weight when pregnant women consumed sugar-sweetened beverages. 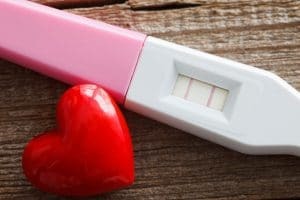 This was the first study to look at the effects of artificial sweeteners on fetal development and infant weight gain. It is important, because childhood obesity is a serious health problem. Both in Canada and other developed countries. Obese children often become obese adults, with all of the associated health problems. Should I Stop Using Artificial Sweeteners? While sweeteners may not hold the promise we had hoped for, there isn’t enough evidence to stop using them altogether. If it’s true that sweeteners affect the healthy balance of bacteria in our guts, you can always encourage the growth of ‘good’ bacteria by eating fermented foods such as yogurt. Scientists believe that the more we are exposed to sweetness, regardless of the source, the more we crave it. The same appears to be true for fats and salt. You may have noticed that if you gradually reduce the amount of salt you add to your food, you eventually need less to satisfy your taste buds. So the healthiest solution is probably to reduce sweetness from your diet as much as you can, regardless of the source! The information in this article should not be taken as professional medical advice. If you are having issues or have health-related concerns, you should see your personal physician. What is Urge Incontinence and Am I At Risk? 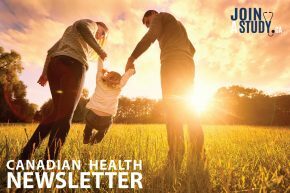 Make sure you receive your free copy of the latest health and medical news, delivered to your inbox each month! JoinAStudy.ca does not provide medical advice, diagnosis or treatment.